Nis is one of those cities with hundreds of restaurants which are, however, completely undiscoverable exactly when you need them. On our first day there, we took a walk around town and in the early afternoon, we decided it was time to eat. Question was: where? We didn’t want to grab a bite in one of the gazillion snack shops and fast food places you can see on the streets. What we were hoping to find was a typical local restaurant where we can sit and enjoy our meal taking our time. It did not seem easy and just when we were about to give up we decided to ask the locals. Today I wish I had hugged the two boys who directed us to Kafana Meze. Serbia is famous for its delicious meat delicacies and I am afraid it is not very suitable for vegetarians. I am, fortunately or unfortunately, totally incapable of giving up meat and I was drooling over the idea of a juicy pljeskavitsa and glass of cold beer. And oh boy, is Meze the best place for this! Kafana Meze is well hidden in one of the side streets and if it did make sense I’d think they were hiding it on purpose. Although the entrance is well designed, it does not prepare you at all for what you’ll find inside. 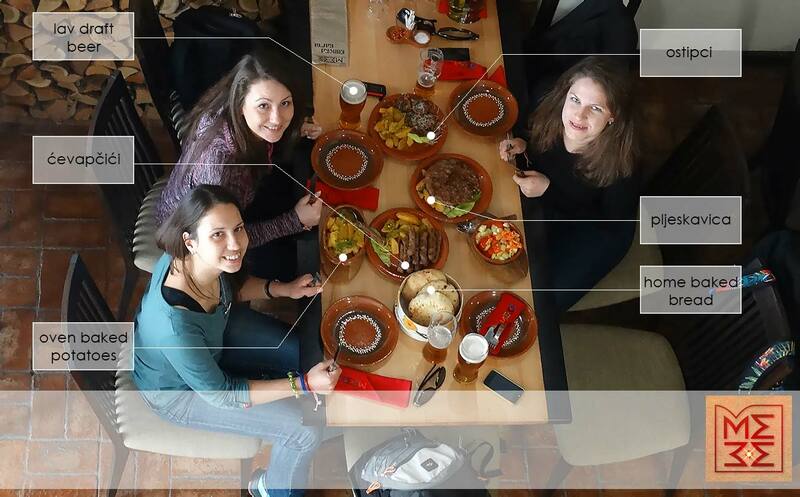 The restaurant is decorated in traditional Serbian style which is so similar to Bulgarian that we felt right at home. The soft music playing in the background is also typical folklore tunes. I loved how well the volume of the music was set – you can hear it without it interrupting your conversation. But enough on that – let’s talk about the food! Kafana Meze serves the most delicious meat meals I have tried in a while! A 300gr. large, burger-like shape local delicacy. It was juicy, mildly spice (barely noticeable really) and so full of taste! Local delicacy in the form of small meatballs. They were as well mildly spicy with melted yellow cheese on top, juicy, tasty and finger-licking-good! Think of them as stick-like meatballs. In Bulgaria we call them “kebapche” and we usually make them slightly larger than the Serbian ones. Again – incredibly delicious with slightly less spices than the above two dishes. We called them “The king of potato dishes”. Incredibly well baked with a smoot, delicious red pepper sauce, and sprinkled with finely chopped parsley; the potatoes melting in our mouths in seconds, leaving an after taste of a home cooked meal, prepared by a loving granny. Warm, soft buns of deliciousness! And now that I am already starving just remembering the amazing food we had there, I’ll leave you here with some pictures and I’m off to grab a bite. If you go to Kafana Meze and are passing by Sofia on your way back (or forth), please, bring me a little something from there. P.S. The service in Kafana Meze is absolutely top notch! I don’t remember the last time I wanted to leave a really big tip – the boys (because all of them were boys on different ages) were friendly, smiley and mindful. Hat off to their serving skills!